The following is an excerpt from Getting Started with Raspberry Pi by Matt Richardson and Shawn Wallace. With these supplies, you can make your own programmable lamp timer using two powerful Linux tools: shell scripts and cron. A shell script is a file that contains a series of commands (just like the ones you’ve been using to control and read the pins). Take a look at the shell script below and the explanation of the key lines. echo Setting direction to out. This line is required for all shell scripts. “$1” refers to the first command line argument. Instead of exporting a specific pin number, the script uses the first command line argument. Notice that the first command line argument replaces the pin number here as well. The “./” before the filename indicates that you’re executing the script in the directory you’re in. If everything worked, the LED should have turned off. Of course, a tiny little LED isn’t going to give off enough light to fool burglars into thinking that you’re home, so let’s hook up a lamp to the Raspberry Pi. Remove the LED connected to pin 25. Connect two strands of hookup wire to the breadboard, one that connects to pin 25 of the Raspberry Pi and the other to the ground bus. The strand of wire that connects to pin 25 should be connected to the “+in” terminal of the PowerSwitch Tail. The strand of wire that connects to ground should be connected to the “-in” terminal of the PowerSwitch Tail. 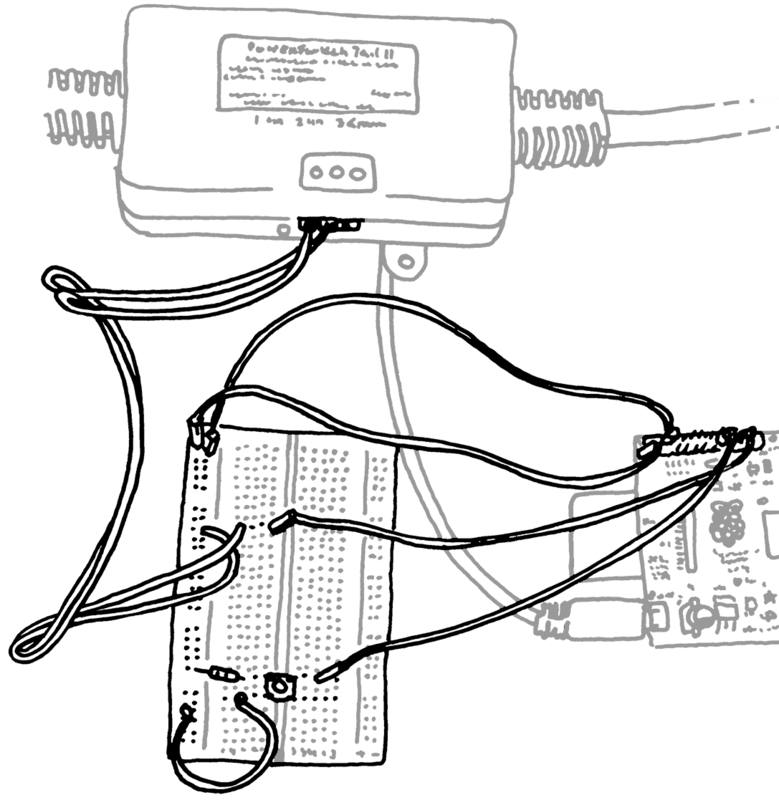 Compare your circuit to Figure 7, “Connecting a PowerSwitch Tail II to the Raspberry Pi”. Plug the PowerSwitch Tail into the wall and plug a lamp into the PowerSwitch Tail. Be sure the lamp’s switch is in the on position. Now when you execute ./on.sh 25, the lamp should turn on and if you execute ./off.sh 25, the lamp should turn off! Inside the PowerSwitch Tail there are a few electronic components that help you control high voltage devices like a lamp or blender by using a low voltage signal such as the one from the Raspberry Pi. The “click” you hear from the PowerSwitch Tail when it’s turned on or off is the relay, the core component of the circuit inside. A relay acts like a switch for the high voltage device that can be turned on or off depending on whether the low voltage control signal from the Raspberry Pi is on or off. So now you’ve packaged up a few different commands into two simple commands that can turn a pin on or off. And with the lamp connected to the Raspberry Pi through the PowerSwitch Tail, you can turn the lamp on or off with a single command. Now you can use cron to schedule the light to turn on and off at different times of day. cron is Linux’s job scheduler. With it, you can set commands to execute on specific times and dates, or you can have jobs run on a particular period (for example, once an hour). You’re going to schedule two jobs; one of them will turn the light on at 8:00pm and the other will turn the light off at 2:00 am. As with other time-dependent programs, you’ll want to make sure you’ve got the correct date and time set up on your Raspberry Pi, as described in ???. This will launch a text editor to change root’s cron table. To change to the root user type sudo su. At the top of the file, you’ll see some information about how to modify the cron table. Use your arrow keys to get to the bottom of the file and add these two entries at the end of the file. cron will ignore any lines that start with the hash mark. If you want to temporarily disable a line without deleting it or add a comment to the file, put a hash mark in front of the line. The */5 indicates a period of every five minutes. As you can see, cron is a powerful tool that’s at your disposal for scheduling jobs for specific dates or times and scheduling jobs to happen on a specific interval. This is the most comprehensive reference guide to the Raspberry Pi’s GPIO pins. If you don’t have enough pins to work with, Adafruit offers this guide to using the MCP23008 chip for 8 extra GPIO pins and the MCP23017 for 16 extra GPIO pins.